As Bloggers it's always great to get feedback from your readers and one of the best and most fun ways is to add polls to your blog posts or sidebar. Now if you have ever tried Bloggers own polls you will soon realise there are some issues. 5) Easy to cheat the polls by cookie clearing and repeat votes. and probably a whole lot of other reasons. Now, if you are serious about polls and want a robust, reliable, configurable and fun way to poll your readers then this tutorial is for you. 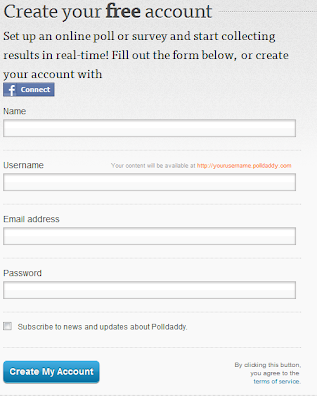 We will show you how to add polls from Polldaddy to either your Blog Posts or Sidebar. 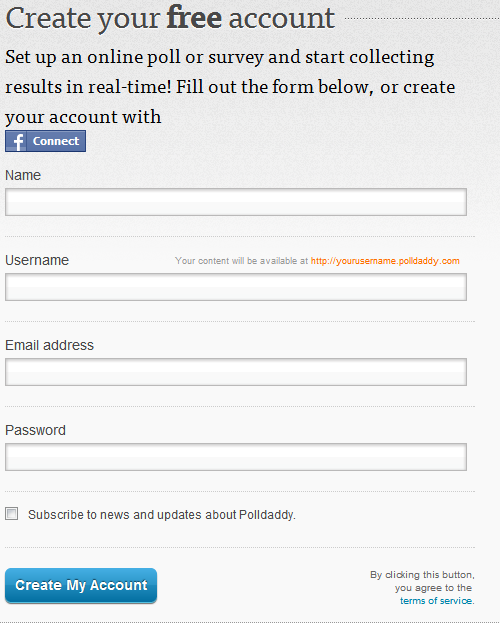 1) First we need to create a free account with Polldaddy. So go here and sign up. You will then be sent and email to confirm your account. Once confirmed you will be taken to your PollDaddy Dashboard where you create new polls, edit old polls, and view the results of existing polls. 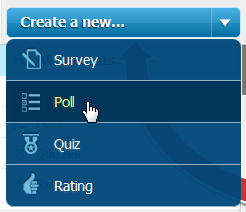 2) So to create a New Poll, select the Create a New Button and Select Poll. 3) You will now be presented with a New Poll screen. So here is were we define the Poll Question and the various answers. Here I will create a simple Poll. If you need more than the default 5 Poll Options, simply click the Add New Answer button. NOTE: You can add images to your Poll Answers by clicking the Media button next to each poll option. 4) Now we can setup several poll options. These are all optional and the default settings should be OK for most cases. a) You can set you poll so that users can only select 1 of the available options or can select multiple. b) You can Randomize the Answer Order so that the poll options appear different each time someone views the poll. 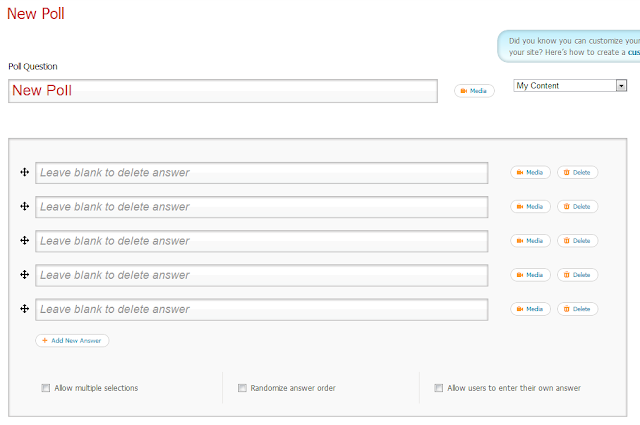 c) You can even allow users to enter their own answers! d) You can also change how your poll looks. There are several great themes to choose from and you can even create your own custom theme. Also you can select the width of your poll. Note: Use Narrow or Medium Widths if you intend to put the poll in your Sidebar, Wide for blog posts. e) There are a number of advance options at the bottom. These allow you to do the following. 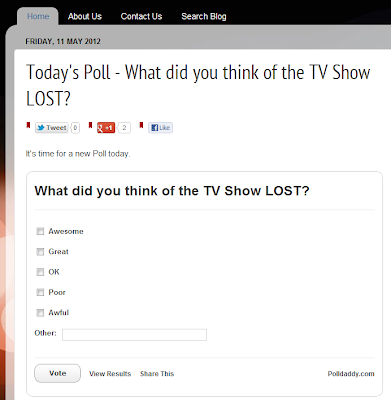 - Allow your poll to be easily shared by others. 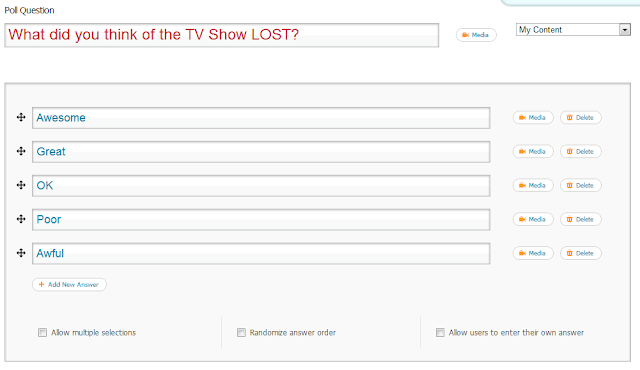 5) Now we have set our poll, we click the Create Poll button at the bottom. 6) You will then be presented with a new dialogue box. This is where you get the embed code that you post onto your site. 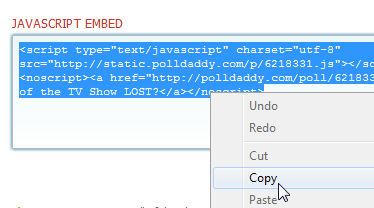 Simply copy the code to your clipboard. 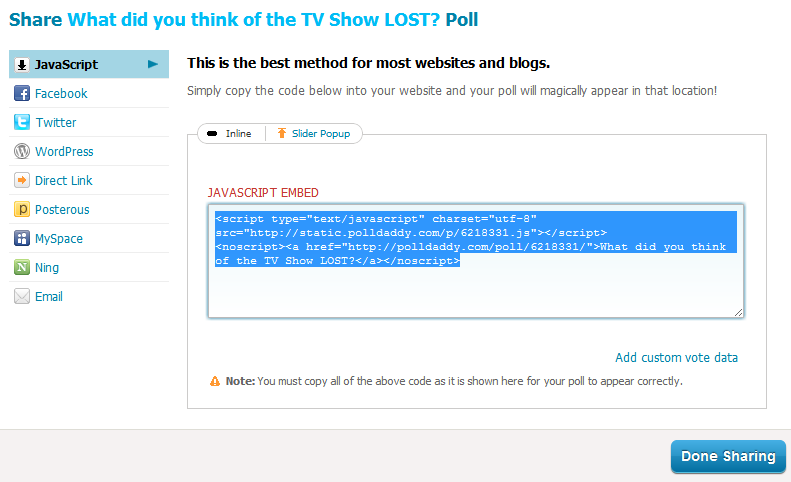 7) Now we need to create a new blog post where we will paste our poll code. So on your New Post screen paste the code. Give your Post a title and an introduction. Publish your post and your poll is now posted! And that's it. Your users can now vote and see the results on screen. Here is the poll we created. Vote on it to see how the results look. 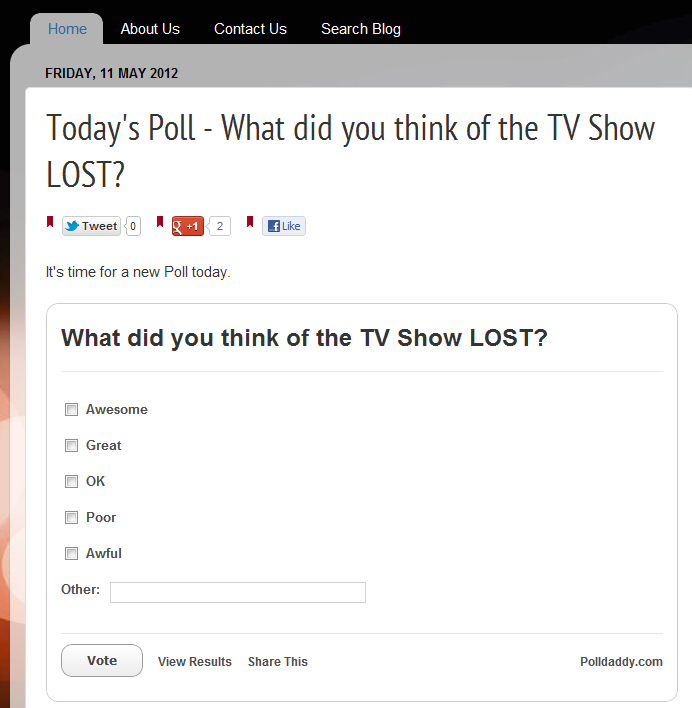 What did you think of the TV Show LOST? 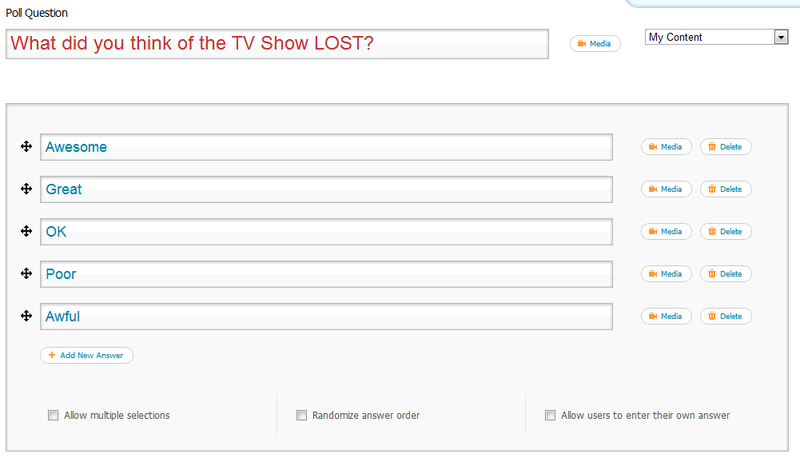 As mentioned earlier, you can at anytime go back and add new polls or edit your existing ones. And you will see your existing polls and can perform various actions. This tutorial has only scratched the surface of all the poll options. As you can see it's both very simple to setup but also has a lot of complexity if you need it. I strongly suggest you read the Further Reading section below if you want to learn more about the advanced Poll features. I hope you have enjoyed this tutorial and found it helpful. If you have any questions please don't hesitate to ask in the comments below. Is it any better than GoogleDocs polls? Excellent tutorial, many many thanks. Very helpful indeed. Google's polls drove me crazy by occasionally letting my poll results vanish in thin air, and I'm sure that Polldaddy will do a much better job. @4d5778fb2a4c42ffbe7e90c27ad50c74:disqus Thanks, glad you found it useful. Polldaddy polls really are excellent. I'm sure that Polldaddy will do a much better job. This is no more for Blogger users. It needs WordPress Account. Well, I know that. but why should we created a WordPress Account, if we endorses Blogger. Instead of PollDaddy Try out toluna.com its way better than PollDaddy and works super awesome with Blogger. It offers more features and has really amazing Look. I Would Prefer to go with Toluna because PollDaddy no longer supports open accounts. You need WordPress account. The only reason, Why i Hate it. And for Toluna, you don't need any WordPress Account :). Seems Win Win Win! @FosterZone:disqus It's no use for us. People can't vote on toluna without having to register or signup via facebook/twitter etc. Polldaddy lets anyone vote without having to register. Yup may be, but now a days everyone has at least Facebook/Twitter account. Thanks for sharing! Is there any way to insert CSS snippets to my blog's advanced settings in order to adjust widths, rather than paying for a premium account? Thank you so much! This worked perfectly! Could you possibly advise me as how/where to learn html and css coding?